The ultimate luxury in train travel in the USA, Canada, Russia, Europe and worldwide with exclusive use of private rail cars including guest management and comprehensive on-board services. Private rail car rentals cost from US$9,000 per day. From movie PR launches to corporate events or family gatherings, private train charters offer a very special and timeless way to travel in style. In the USA, private rail cars are most frequently added to scheduled Amtrak trains. America has the greatest number of private rail cars for hire. As such, the Amtrak rail network offers you wide range of travel and vacation choices. 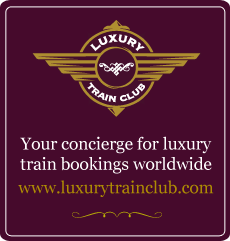 Our luxury and VIP train travel services make the best private train charters in Europe available to international clients, producing seamlessly memorable journeys. We arrange private railroad trips on trains such as the Venice Simplon Orient Express, Northern Belle, Royal Scotsman and British Pullman. We provide private carriages on all these services if booked well in advance, but they are part of the brochured trips of course and not on private timetables. We can do the same on all luxury trains in Europe, e.g. The Golden Eagle Trans-Siberian Express. We also arrange private train charters on scheduled services and for small or large groups throughout Europe on request. We operate private railcar chartering elsewhere in the world including Russia, Australia, Brazil and India. The cars you can charter in each country are unique - please contact us for more information. One example of a unique private rail car for rental is the Prince's Carriage in Morocco which can run attached to scheduled services or independently as a special "royal" train across the Moroccan rail network.